The general power of attorney can be a great convenience when you need someone else to perform financial transactions for you. Often, these function as a safeguard if the principal cannot attend to business affairs, for example, because an injury leaves him or her in the hospital for several weeks. If you had a power of attorney in place, an agent would be ready to act in your place and do nearly anything you have the right to do, including paying bills, opening accounts, selling real estate, and entering into contracts. 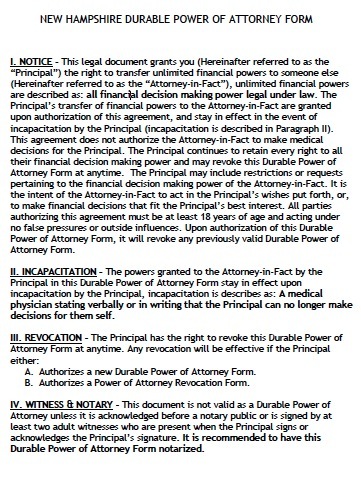 A power of attorney is also convenient if you will be absent from home for an extended period. In that case, you could arrange for the document to be limited so that the agent will only have the right to perform the specific acts you authorize. Thus, you could arrange for the agent to pay your bills and deposit your checks, but not to have any other power over your property. To ensure your agent continues to act in your best interests, you can require him or her to keep records of his or her transactions, and regularly report his or her activities to you or a third party.